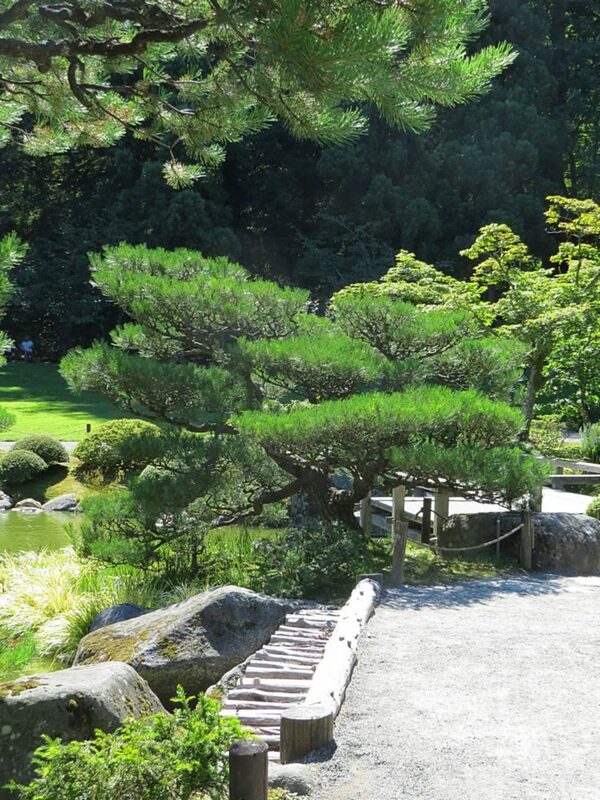 It should not be surprising that some of the very best examples of Japanese gardens outside of Japan are to be found in the Pacific North-West, in view of the region’s close cultural ties with the Far East and the need for reconciliation after the Second World War. The history of the Japanese in the region is one of the darkest chapters in America’s history. The opening up of the western states depended firstly on Chinese labour to build the extensive network of railroads, but following the Chinese Exclusion Act of 1882, industrialists increasingly sought a pool of cheap labour from Japan. Many of these had been poor farmers and their knowledge of sophisticated methods of irrigation brought marginal land (particularly in California) into cultivation for fruit, vegetables and flowers, whilst in Idaho many set up small farmsteads. Success brought resentment, and in 1907 the Gentlemen’s Agreement between the US and Japan ended immigration of labourers, but permitted spouses and children to join their fathers. The bombing of Pearl Harbour, and the US declaration of war on Japan led to the internment of 140,000 Japanese Americans (2/3 of whom were second generation American citizens) in 10 concentration camps, losing homes, businesses, friends and savings. No cases of espionage or sabotage ever came before the courts. It was not until the 1980s that the Commission on Wartime Relocation and Internment of Civilians concluded that ‘internment was based on prejudice, hysteria and a failure of political leadership,’ and in 1988 President Ronald Reagan signed the Civil Liberties Act offering fulsome apologies to Japanese Americans for the internment and providing reparations. In the later 20th century, in common with others, the Japanese Americans moved to the cities, notably Seattle and Portland, retaining their strong cultural identity, and as a consequence close bonds developed between these cities and Japan. 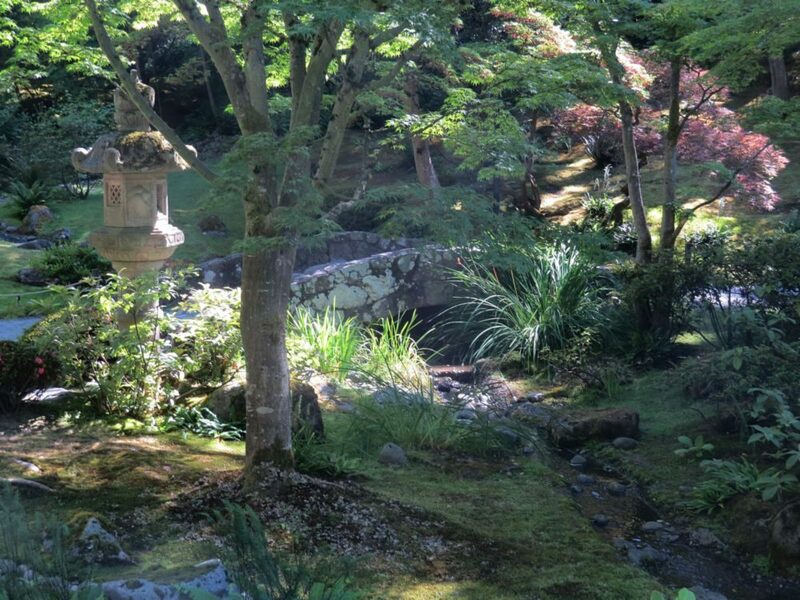 The Seattle Japanese Garden which had been muted for many years finally opened in 1960 with gifts of a teahouse from the city of Tokyo and the Kobe lantern from Seattle’s Japanese sister city. 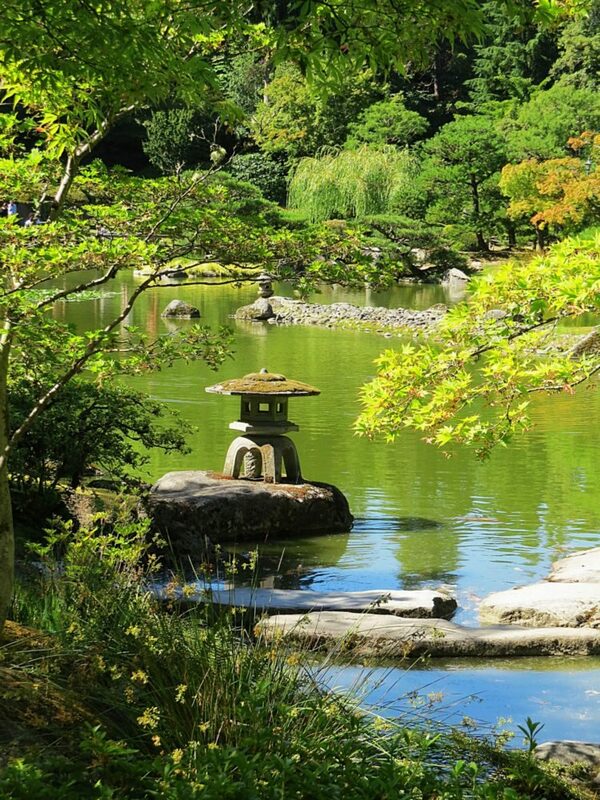 Designed by the acclaimed Japanese designer Juki Iida the garden, based on historical precedents, is a traditional stroll garden of the late 16th and early 17th centuries. 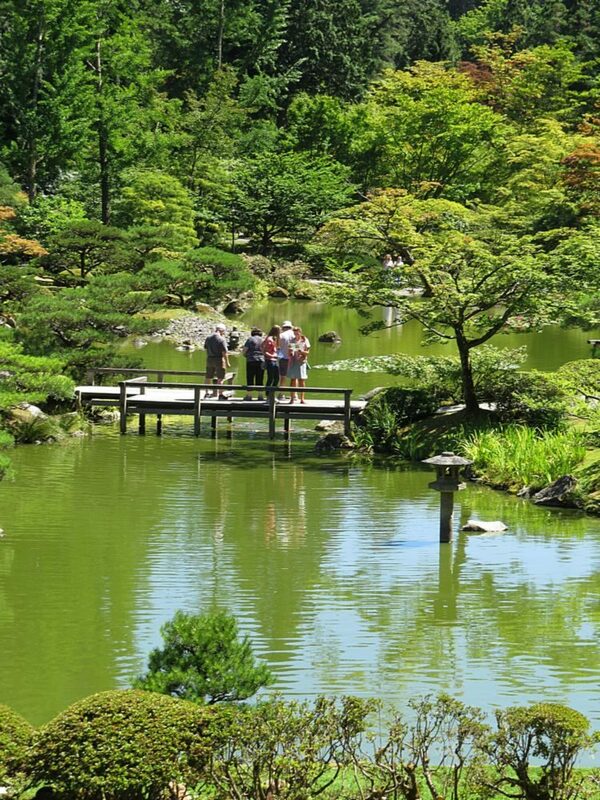 It is intended to be a journey through varied landscapes of Japan around a large pond set out with authentic planting of maples, wisteria, camellias, iris beds and an ‘orchard’ of flowering cherries all of which bring colour to the garden in early May and November. 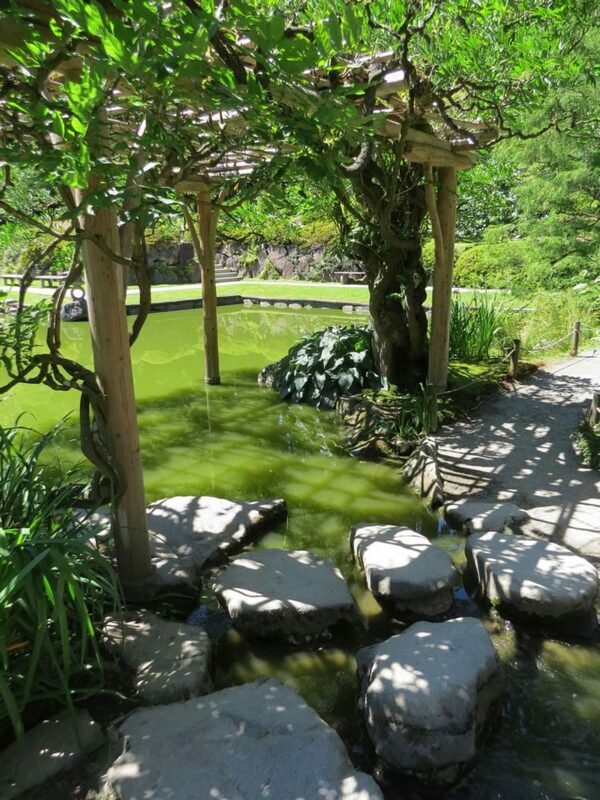 At other times of year, the many features of the garden such as the stone and earth bridges, the discreetly placed stone lanterns and pagodas, ‘dry’ pebble watercourses, gnarled wisteria trunks and plantings of clipped conifers and box balls make this a delightful and authentically Japanese experience. The Teahouse, burnt down by vandals and rebuilt in the 1980s, is disappointingly set aside from the rest of the garden behind hedges, and consists of an outer garden where guests are asked to wait and an inner garden surrounding the small building. 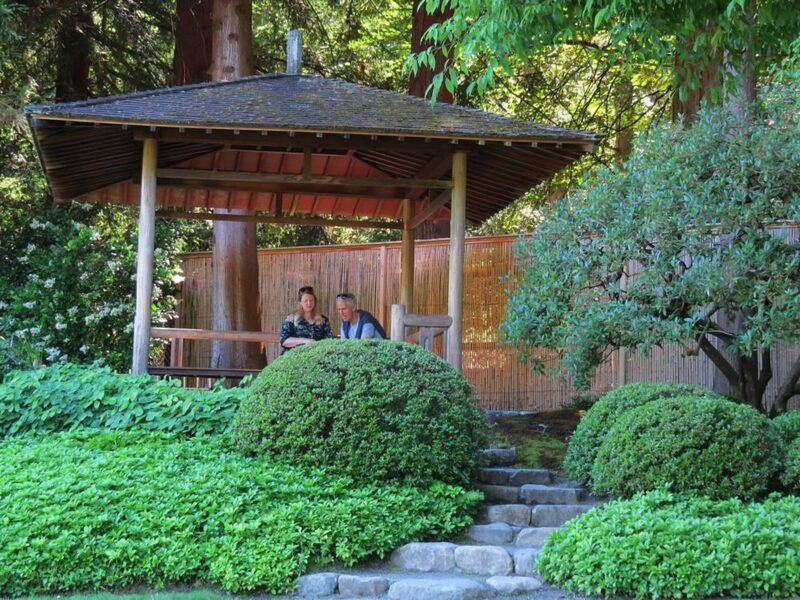 Tea ceremonies are held on a weekly basis and the schedule can be found on the garden’s website. 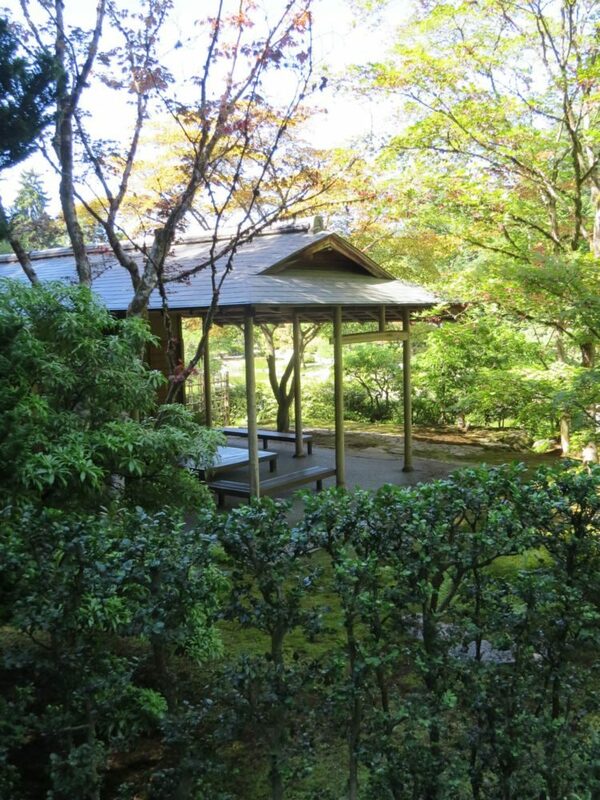 The other traditional building on the site is an azumaya (arbour) intended for contemplation and set at the top of a small rise with views over the pond. 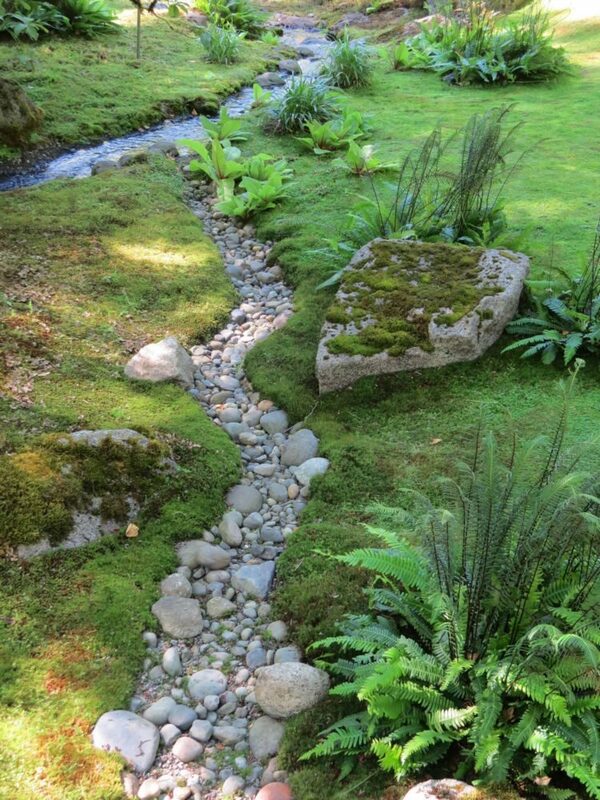 If the garden has a drawback, it is the green algae bloom in the pond which could be resolved with better filtration and water movement, and which the garden brochure poetically describes as the ‘cloudy green waters reflecting the land and the sky’. 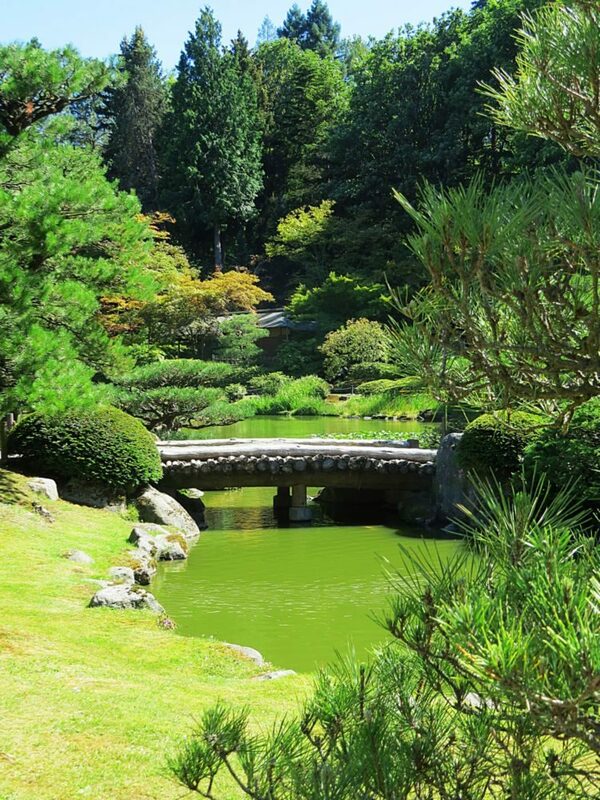 Seattle is a spectacularly beautiful city and the Japanese Garden is one of its finest and little visited attractions and deserves to be better known.